This soft-baked style peanut butter cookie recipe is even more of ants in my pants since it calls for no other frills but peanut butter. Yes, you heard it right. Ain’t cookies supposed to be thin hard? Well, they were – at least all these times that I’m struggling, aging. Okay sounds a bit extra, but that’s pivotal. I’ve never come to the recognition of cookies being at the very best puffy state, like ever. This leads to me getting a little, so little hysterical. Oh holy on where I have been – for suddenly now, all thin hard cookies just became too crumbly, too stale, too friable for me to handle. If cookies were ever this soft, I would have never come to gooey choco candy bars! From this point on, no matter where I am, I will always go antsy for this sweet treat. It’s solid, super mellow and melting. 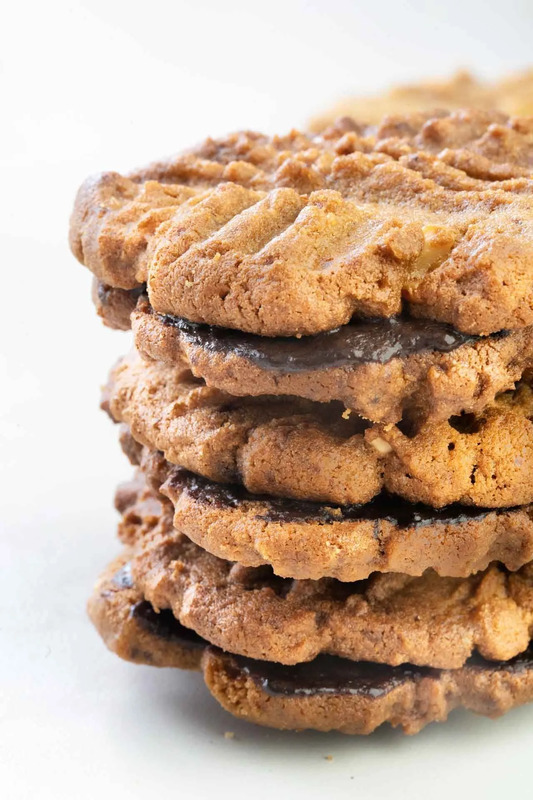 Peanut butter cookies are chewy and tender enough to be piles of sweet preys, but there’s somehow still enough crinkly mouthfeel at the top edges – so to be called a baked something goodness. The possibilities for extra flavor are indeed endless, yet no chips or sprinkles or special stuffing is a must-have to bring forth the very genuine peanut butter taste. Its notable softness is lent through the admixture of creamy peanut butter, vanilla and egg. Simple-makes-perfect it is. That is just to say, peanut butter cookies are enough to be the rinky-dink at my bachelorette party (like, if I ever had one). Or I might say – any cookies will do it good for the wing-ding part, let alone this heaven peanut butter thing. This sweet deal is an appetizer in a nutshell. You can always throw some for backyard chills, Christmas smorgasbords, or just eat them straight out because you’re in the crave. Sounds jelly by rights, no? For possibly a supportive side note: Let your peanut cookies sit a couple minutes or so in the oven if you wish for a bit crunchier batch. Then you can rest at ease from that point on - they'll stay exactly as soft as they were at the first place for days. 1. Preheat the oven to 350F (10 minutes beforehand will be good). Combine all-purpose flour, baking soda and salt together in a medium bowl, save for later. This should be the first mixture. Stir peanut butter, butter, white and brown sugar together in a medium bowl. This should be the second mixture. Add the beaten egg and vanilla extract to the second mixture, beat until well combined. This should be the third mixture. Gradually pour the first mixture to the third mixture, whisk well until all smooth and there you have the cookie dough. 3. Scoop out your cookie dough and roll into balls, then flatten them with your palm. Mine used about 2 tablespoons - feel free to resize them however you wish. 4. Line your baking sheet with parchment paper. Place your flatten dough balls about an inch apart from each other for further rise when baked. I also drew crossing patterns by pressing the doughs with a fork. It's optional, but it did give some more appetite after all. 5. Bake your batches in 10 minutes each. After removed from the oven, let them cool for a couple minutes on a wire rack before bringing to serve. Got an airtight container and your cookies are all good for the next 2 weeks - that is if there's any cookie batch could stay sound for 2 weeks. You know what I mean. Please leave the dough chilled for at least 3 hours just so it’s going into the oven cold. This is merely the best way to make your circular cookie pieces as firm and stiff as they should be. Otherwise they'll be just messy bundles, no hell aesthetics, the least bit. A refreshing glass of milk or sweet raspberry smoothie would possibly go just right with peanut butter cookies. And shall you get some chocolate dipping, too? Tried this recipe?Mention @HealthyKitchen101 or tag #healthykitchen101!